Dr. Paul Mallouk, dentist in Delano, CA, sheds some light on the official dentistry insignia or symbol. The symbol of dentistry is borrowed from the Greek god of medicine and healing, Asclepius. It was adopted by the American Dental Association (ADA) in 1965, and comprises elements that date far back in Judaism and Greek mythology. The emblem is in the form of a physician’s staff with a snake wound around it, flanked by leaves on both sides, inside a black triangle, and surrounded/intertwined with a green/brown circle on a purple background. As mentioned before, the symbol was inspired by the Greek mythology. Asclepius was the son of Apollo, who is symbolized as the god driving a chariot across the sky while carrying the sun. Apollo himself had many abilities, including healing. Asclepius was also associated with healing, and his symbol – the one adopted by the ADA – was an indicator of his ability to assume the form of a serpent and heal the Greek people. There is a story that he once healed the Greek people that were afflicted from a Roman plague. Today, snakes are perceived in a negative connotation, but from a mythological viewpoint, the snake was considered a creature of rebirth. The ability of the snake to shed its skin was viewed as rejuvenation or healing. This is also why the symbol of Asclepius resembles that of Caduceus – symbol of medicine – which comprises a winged staff with two snakes coiled around it. The two branches of leaves on the dentistry emblem have berries on them to draw a specific reference to the number of teeth people have: 32 leaves for the 32 permanent teeth; and 20 berries for the 20 primary teeth. 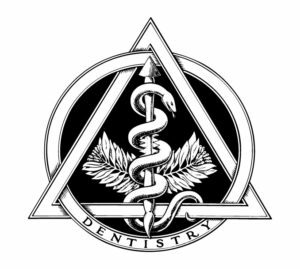 The triangle is not exactly a shape, but the Greek letter delta, Δ, referring to dentistry, while the intertwined circle is omicron, O, representing “odont” which is the Greek word for tooth. The purplish color is actually lilac, which was chosen as the color of dentistry back in 1897 by the National Association of Dental Faculties (NADF). Generally, logos and emblems are not intended to relay the message at face value. They are meticulously designed so that each element has a deep meaning that you will appreciate if you dig enough. 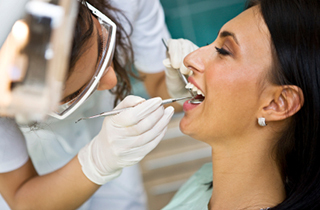 The symbol of dentistry is truly creative, according to Delano dentist, Dr. Paul Mallouk. This entry was posted in Educational and tagged dentistry emblem, dentistry insignia explained, dentistry symbol meaning, origin of dentistry symbol. Bookmark the permalink.